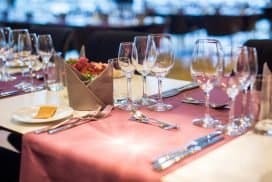 L’s Resto offers a tasteful lunch consisting of a cold buffet, as well as meat, fish or vegetarian options as a hot component, served at the table. Here you have the opportunity to sit down and enjoy an affordable quality lunch for up to 140 guests per sitting. The restaurant is perfect for entertainment, important business lunches, client events, dinners and banquets. With us, nothing is impossible, and the menu offers dishes made from only the finest ingredients.